Smooth, dirt-resistant surface provides better hygiene. 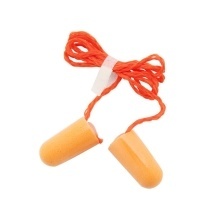 Earplugs are easy to roll down for quick and easy fitting. Tapered design fits comfortably in ear canals. Soft polyurethane foam is hypoallergenic. Noise Reduction Rating (NRR) 29 dB, CSA Class AL. The corded design makes it not easy to be lost.